PAWTUCKET, RI, U.S.A., March 11, 2015: A new series of masterbatches for polylactic acid (PLA) bioplastic increases the heat distortion temperature (HDT) and impact strength of the resin and substantially reduces its cooling time in injection molding, making possible semi-durable and durable applications which until now have been closed to standard PLA, it was announced today by Teknor Apex Company. 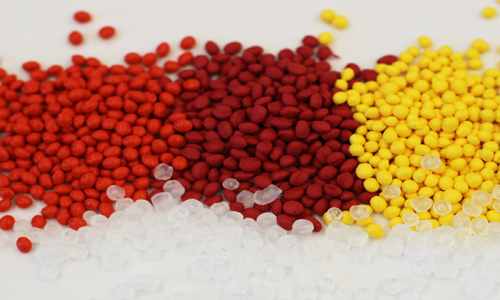 The company’s Bioplastic Division will introduce the masterbatches at NPE2015 (Booth S24055). Terraloy® 90017A and 90017B masterbatches are based on, and are for use with, IngeoTM High Performance (HP) resin. NatureWorks LLC has developed Ingeo HP resin to provide a higher HDT and greater impact strength than standard PLA, when used with a nucleating agent such as LAK-301 from Takemoto Oil & Fat Co., Ltd. While the nucleating agent can play a critical role in reducing cooling time by promoting the crystallization of PLA, it is difficult to disperse properly in the HP polymer. Combining the nucleating agent with other ingredients, Teknor Apex not only improved dispersion but enhanced the overall property profile of the resin, while shortening cooling time from nearly 300 seconds to less than 40 (see graphs). Teknor Apex has entered into a strategic alliance with Takemoto Oil & Fat in developing the new masterbatches based on NatureWorks Ingeo™ biopolymers. NatureWorks will also exhibit at NPE2015 (Booth S35041). “While PLA has typically been used in single-service food service products, Terraloy 90017A and 90017B masterbatches open the way for Ingeo HP PLA polymers to be used in semi-durable and durable markets due to improved heat resistance, impact properties, and cycle time,” said Edwin Tam, manager of new strategic initiatives.